Previously I began an introduction to Neural Engineering highlighting the key aspects. 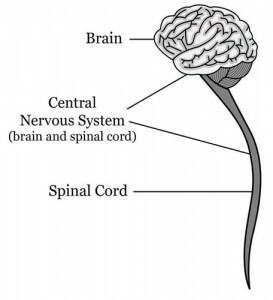 As we can clearly see, the central nervous system is a combination of the brain and the spinal cord. The Peripheral Nervous System on the other hand is the network of neurons which lie beyond the central nervous system(i.e the brain and the spinal cord). Now what is this neuron? A neuron is nothing but a nerve cell which is electrically excitable that processes and transmits information through electrical and chemical signals.So this is where engineers can dive in to explore the electrical impulses of the neuron as electricity falls in the domain i.e field of study of engineers and this is how neural engineers evolved 🙂 ! Neurons are located both in the central nervous system and the peripheral nervous system. The central nervous system is connected to every part of the body by 43 pairs of nerves. 12 pairs go to and from the brain, with 31 pairs going from the spinal cord. There are nearly 45 miles of nerves running through our bodies. Messages travel along the nerves as electrical impulses which travel at speeds up to 248 miles per hour. Sensory neurons: Information is sent from sensory receptors (e.g., in skin, eyes, nose, tongue, ears) TOWARD the central nervous system. Motor neurons: Information is sent AWAY from the central nervous system to the peripheral nervous system(e.g., muscles or glands). Interneurons: Information sent BETWEEN sensory neurons and motor neurons. Most interneurons are located in the central nervous system. In my next article, I’ll begin a discussion on Brain Computer Interfaces.